In Algebra 1, students learn how to work with various types of expressions both algebraically and geometrically. They learn how to solve linear and quadratic equations and how to represent various expressions in the Cartesian plane. We introduce students to the rich field of complex numbers, as well as to important common functions and concepts in discrete math. We continue the emphasis on challenging word problems from Prealgebra, so that students learn when and how to apply their new tools. 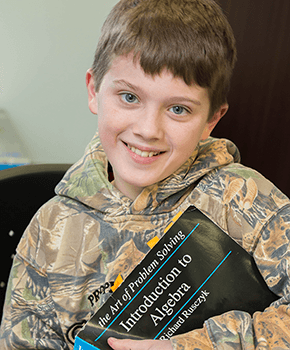 Many of the more challenging problems of Algebra 1 come from contests such as MATHCOUNTS, AMC 8, and AMC 10. Students completing Algebra 1 are ready to apply their algebra skills to our Geometry course. Textbooks: Introduction to Algebra and Introduction to Counting & Probability by Art of Problem Solving. Hardcopy and online version of the textbooks are included in the tuition and fees of this course. Below are examples of some of the types of problems that students will encounter in our Algebra 1 course.